An interesting article posted by The Advisory, independent expert advice for house sellers. We received that after telling the online agent we’d decided not to use their services and instead were going with a high street estate agent. High street agents (like online estate agents) will find your buyer by listing your property on Rightmove. Both high street agents and online agents will get you the same end result. The only difference between the two types of agency is that online agents charge £1,000’s less in fees. We wanted to find out if they’re right. Or if a strategically chosen ‘no sale no fee’ high street estate agent will get you a superior result? 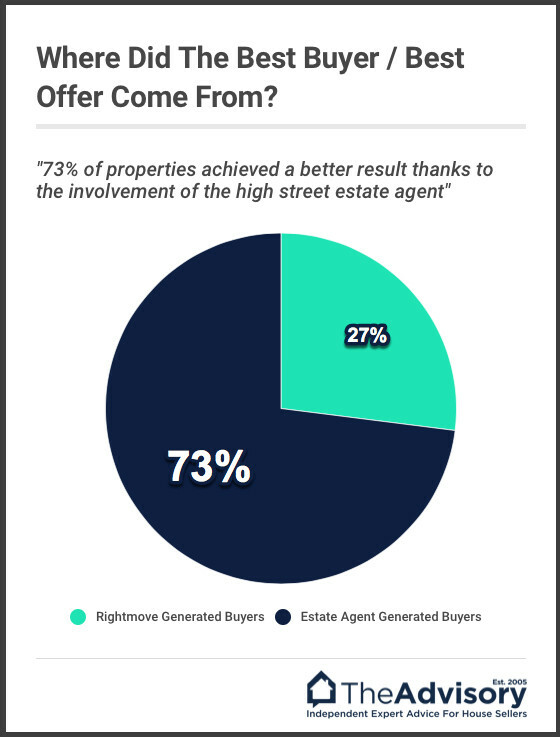 Q: How much interest is generated in a property by a high street agent over and above the direct interest generated by the Rightmove advert? That national online / hybrid estate agency services do little more than just list property on Rightmove (and other property portals) and wait for enquiries to happen on their own. As serial (and unemotional) house sellers we have an interesting / unique dataset to analyse. We choose estate agents based on strict and proven criteria. We price property ‘to sell’ (we do not ‘test the market’). We have a 100% sales success rate. An audit of our historic property trades and ‘managed’ sales to see where viewings and offers originated, would give us solid insight into the impact a strategically chosen local estate agent (and accurate pricing) brings to a property sale. …Will we ‘net’ a higher ‘walkaway figure’? Without the involvement of a high street estate agent, 73% of the homes we sold would either; not have sold, taken longer to sell or needed a price reduction. On average, the buyer introduced to the property by the estate agent paid 5% more than the highest offer from a buyer generated directly from a portal enquiry. Given the UK average estate agency fee is 1.18%+VAT, good high street estate agents would seem to be selling themselves short. 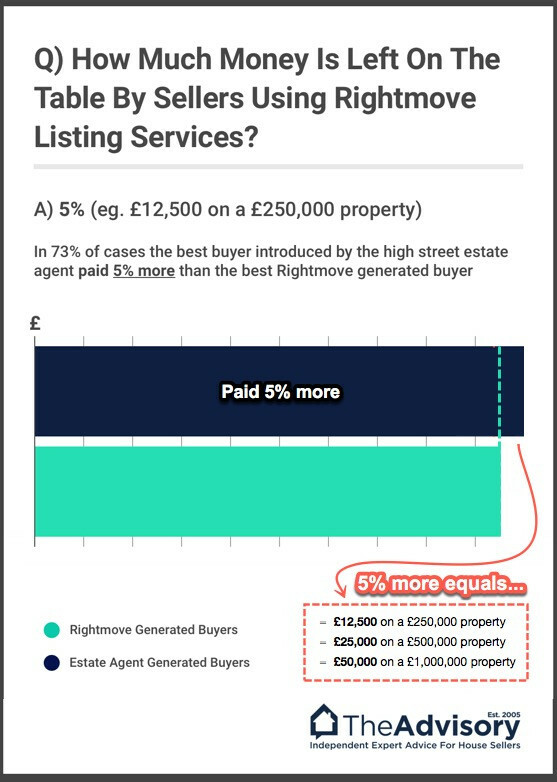 Based on this research, good high street estate agents could charge up to 4% commission +VAT and still achieve for their clients a better ’walkaway figure’ compared to selling with a internet only listing service charging £849. However, since conducting this study, things have changed. Great news BUT exactly how much money did you unwittingly leave on the table? We can tell you, these thoughts are unpleasant ones to have. It is fair to say the best internet only estate agents are just as good (even a little better) than your ‘average’ high street estate agency. The best high street estate agents provide the gold standard when it comes to achieving the highest ‘walkaway figure’ from your sale. The best national internet only listing agents can’t touch the best high street estate agents. Listing property on the portals (Rightmove, Zoopla etc..) and waiting for the phone to ring is a fundamentally inferior sales strategy compared to listing property on the portals plus (+) proactive and focused engagement with a targeted buyer database (a.k.a. – high street estate agency hustle). We wanted to know what made a buyer (applicant) choose to physically view the properties we were selling. Was it the internet advert (a portal listing) or was it the estate agent? #2: We audited the offers put forward from applicants to uncover which category of applicant the strongest offers (and buyers) originated from. #3. The agents were not informed of the purpose of the research request. #4. Many of our historic sales had incomplete records but in the end we were able to secure a compete dataset for 202 sales. The raw data used in this study can be found here. Due to the sample size (202 sales) we make no claim that this is a definitive study. However, it is far from irrelevant and undeniably highlights a trend we hope will be investigated further by those with access to larger datasets. "Your dedication, combined with your professionalism and friendly manner have made you a joy to deal with. I would have no hesitation in recommending you to anyone who is looking for a professional estate agent in Somerset."